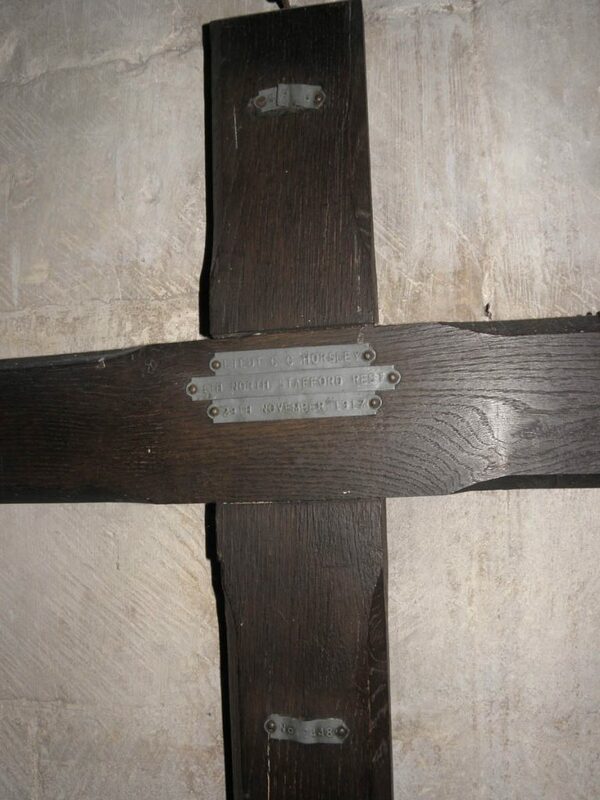 Location: St Michael and All Angels Church, High Street North, Stewkley, Buckinghamshire, LU7 0HN. Thickness of wood: 40 mm. Mounting to wall: 100 mm metal plate with hole, screwed to cross, hanging on large, headed pin nailed to wall. Detailing: chamfered edges all round to cross shaft and beam, timber stained or varnished to dark brown wood colour, pointed end of shaft showing sign of some rot and woodworm, possibly from shallow insertion into ground. Generally good condition. Notes and Observations: Because of the sandy nature of the soil at Wimereux Communal Cemetery, near Boulogne, Pas-de-Calais, the gravestones are laid flat on the graves. The sandy soil probably contributed to the good condition of the wood of the cross in the original grave. No.2448 refers to the Imperial War Grave Commission’s Cross Erected reference Number E.2448. Claude Cressy Horsley was born in Islington in 1883, son of civil engineer, Charles Cressy Horsley and his wife Mary. They lived at 28, Grange Road, Canonbury, North London. Claude was baptised at All Saints Church, St John’s Wood on 15 February 1883, and was educated at Oakham School. He became employed as a merchant clerk. The 1911 Census shows him boarding at Potash Farm, Stewkley, Buckinghamshire, the farm of Frederick Hedges, where he was learning farming skills by private means. On 30 December 1911, he was married in Willesden to Katherine Marie Brown, the daughter of Mr E Bloxham-Brown of Leighton Buzzard, and they went to live at “Stockall”, High Street North, Stewkley. Claude volunteered for the Public Schools’ Battalion in September 1914 and was commissioned Lieutenant into the North Staffs in April 1915. He went to France with 4th Battalion on 21 April 1916. He was wounded near Ypres in June 1916 and evacuated to England. Returning to action in France he was again wounded near Passchendaele on 17 November 1917 and died from his wounds in hospital near Boulogne (Queen Mary’s Army Auxiliary Corps hospital, Wimereux) on 28 November 1917. He is buried in Wimereux Communal Cemetery, grave ref: IV J.4. 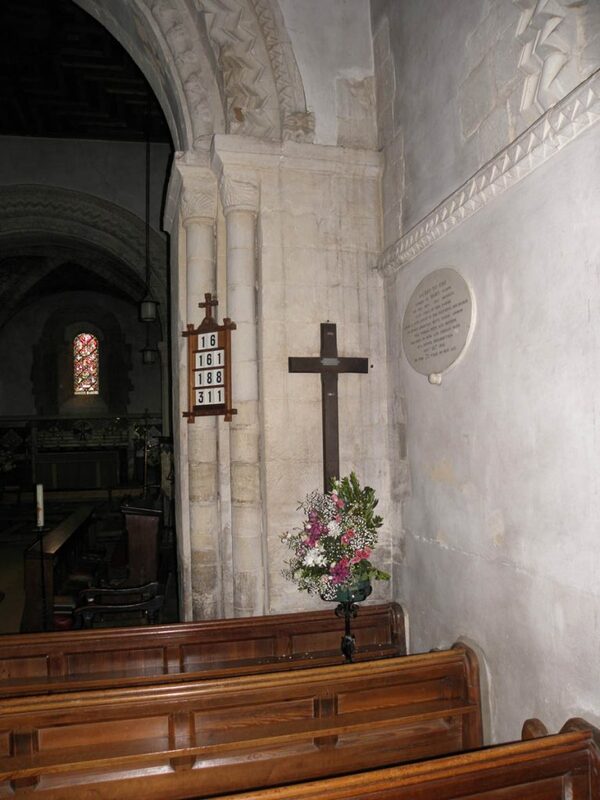 His name is honoured on the Stewkley Village War Memorial in the centre of the village at the junction of the B4032 Leighton Buzzard, Winslow and Wing roads, and also on the St Michael’s Church War Memorial triptych on the north wall inside the nave of the church. He was awarded the 1914-18 British War and Victory Medals. 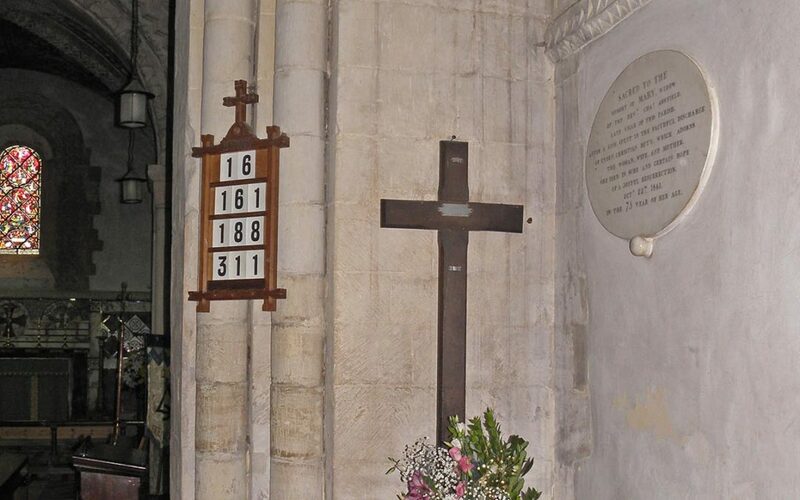 The Horsleys were members of St Michael’s congregation, and in addition to his grave marker, a small silver chalice engraved with his name and given in his memory by his widow Katherine in 1917, is still in use in St Michael’s today. Katherine Horsley continued to live at Stockall and died in Aylesbury in November 1964. She never re-married.